Davanti Enoteca is one of the first signs of something the San Diego dining scene has long needed. I truly love good Italian food, ordinary Italian food not so much. 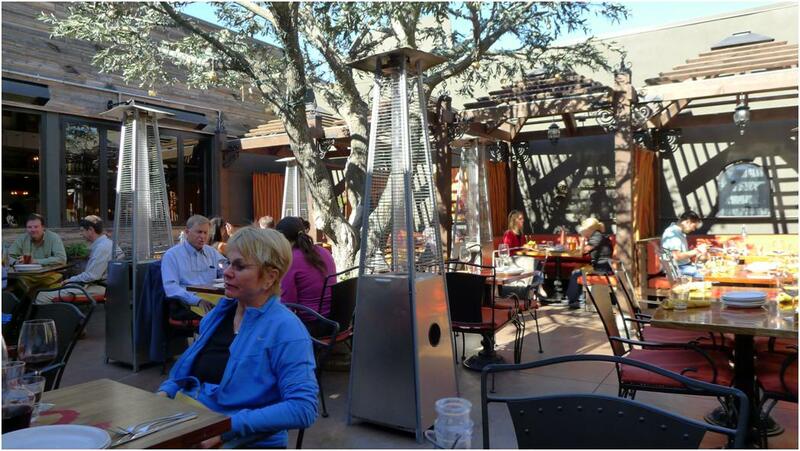 Sadly, while the food scene San Diego has improved tremendously – we have several restaurants that rival some of the best of New York, Chicago or San Francisco and a diverse and deep ethnic food scene – the Italian food in this town is, by and large, mired in mediocrity. For a City with a district called “Little Italy” and an entertainment district (the Gaslamp Quarter) that sports numerous Italian restaurants it seems odd that we appear incapable of offering an Italian dining option of the highest caliber. Some of it may be down to the fact that one owner – the Busalacchis – own no less than eight Italian eateries in town and so many others seem to copy their menus. For a cuisine that features enormous variations in regional cuisine this has led to a depressing sameness amongst San Diego’s Italian offerings. 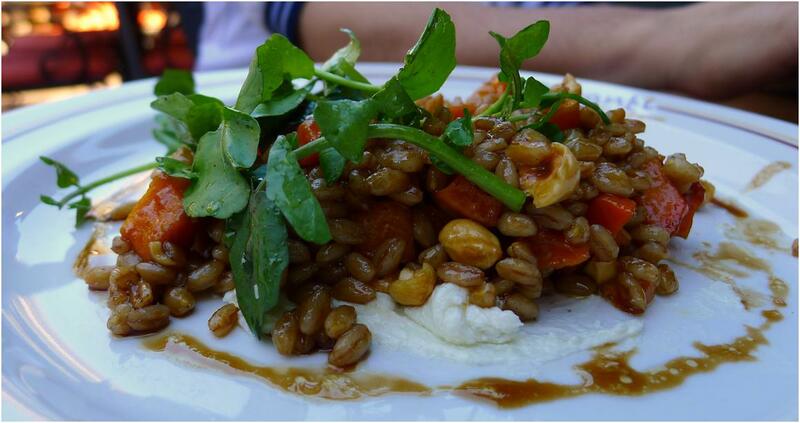 Our first starter was the Roasted squash + farro + goat cheese + hazelnuts + watercress. 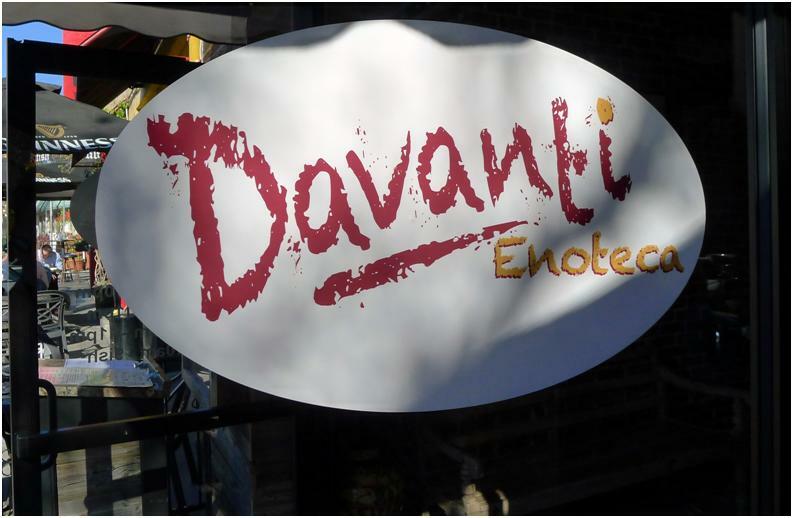 Perhaps my least favorite thing about Davanti is the supremely awkward convention of naming the dishes with a rather comprehensive list of all the ingredients on the plate connect with plus signs. It was a superb dish featuring wonderful textural contrasts, perfectly dressed watercress and deep flavors that crash against each other in surprising ways. It is an innovative antipasta that feels at once cozy and modern. The same sorts of textural contrasts that made the Roast squash starter so good also featured in our other antipasta, Roasted beets + walnut butter + crème fraiche + candied walnut. 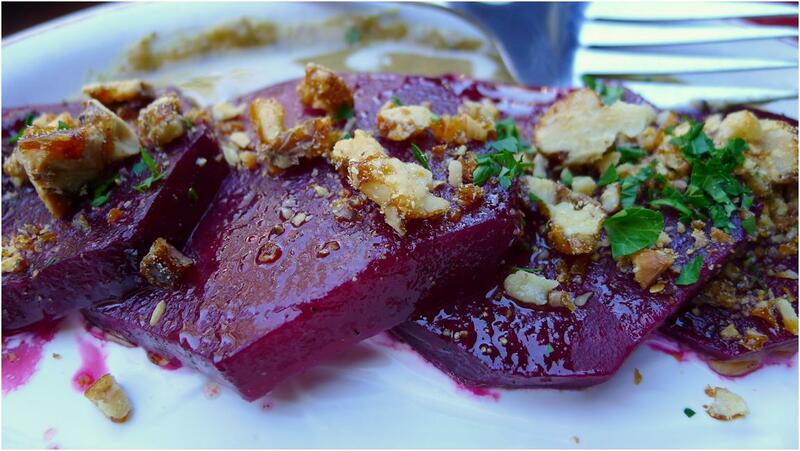 The candied walnuts played well with the supple yet solid feel of the perfectly roasted beets. The appearance of walnuts on the plate twice – once candied and once as a nut butter – brought the entire dish together and clearly into focus. The one somewhat puzzling note in the dish was the crème fraiche. While it offered a second sort of richness on the plate, that feature seemed somewhat surplus to requirements. I would not have missed it had it not been there. Our main course was the paccheri con salsiccia e pomodori al forno, which the menu thoughtfully translated as “giant rigatoni + sausage + oven roasted tomato + parmigiano.” This is the sort of pasta dish that San Diego’s Italian dining scene has been sorely missing. Classic, yet different, featuring homemade pasta that was absolutely perfectly al dente, with not an ounce of influence from the Italian-American, floating-in-red sauce bastardization of Sicilian cuisine. 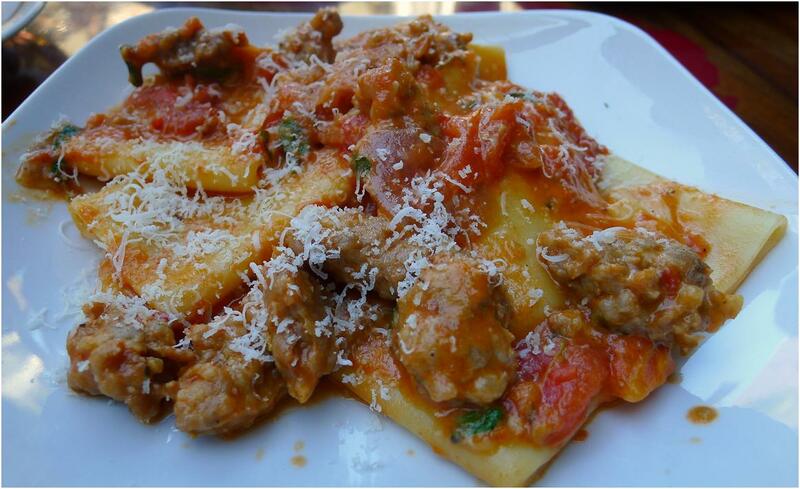 The kiss of spice in the sausage conversed with the roast tomato’s sweetness and acid notes all the while maintaining the rigatoni’s star status. If Davanti Enoteca is emblematic of a new direction for San Diego’s Italian restaurants, that can only be a good thing.